The Yoplait story - how Yoplait became "French for yoghurt"
Towards the end of 1981 there was a Big Project afoot at ad agency Clemenger. Our client Plumrose, best known at the time for “ham in a can”, was cooking up plans to launch a new food product that would change the way Australians ate. Unfortunately it was so secret that they couldn’t tell us what it was. Media and marketing plans had to be submitted for “Product X”. Finally, the time came to develop the television campaign and we gently pointed out that, at this point, they probably had to trust us with the name and nature of their product. Sworn to secrecy, we gathered to take the brief. It was revealed that the new product was Yoplait Yogurt (yes, yogurt without the “h’), that it was the leading brand in France, and that it was to be sold in a revolutionary twin pack. Yoghurt, at that time, was not a mainstream food. The average Australian associated it with mad Hungarians, health nuts and, if you were of the travelling classes, breakfasts in Greece. The average annual yoghurt consumption was just 0.9 kilograms per head. Yoplait, with its creamy texture, sweet taste and large fruit pieces, would change all that. Before that could happen, though, we needed a campaign. How could we get this product with the funny French name into Australian shopping trolleys? I’m not sure when it occurred to me that the twin pack looked a bit like the Arc de Triomphe, or that positioning the product in the middle of that famous Paris intersection would be a great attention-getting device. Then the art director suggested having a child use the twin pack as a pair of binoculars. We decided on a gendarme as our presenter and tied the whole idea together with the line “Yoplait. It’s French for yogurt’. Perfect. Except that there was a little sideshow happening in the southern Pacific called the French nuclear tests. Back in 1974, atmospheric tests over Mururoa had been halted after international legal action and a boycott of French products in Australia and New Zealand. People got carried away and even boycotted goods with French names, like croissants, even though they were made by perfectly respectable Australian bakers. Legitimate targets like Beaujolais and Club Med also felt the pinch. Despite bowing to international pressure on atmospheric tests, the French had continued with underground tests, and were still doing so. Research groups were hastily convened and moderators probed group members for negative reactions. None were forthcoming. I had written myself a trip to Paris. In the 1980s, very little high-end production of television commercials was done in Melbourne. All the most talented directors were deemed to be in Sydney. A commercial shoot in Sydney was a lavish affair, involving large crews and spectacular catering. (In Melbourne, we had become accustomed to working fast with a small crew, and ducking into the local pub for a pie at lunchtime.) We joked that our ideas were driven by catering. “First choose your caterer,” went the popular wisdom. “Then figure out which production companies use that caterer. Then find a director who works for one of those companies and write a script that’s just right for him (it was always a him).” It was only half in jest. The writer, the art director and the agency producer always attended the shoot. In Sydney we stayed at the Sebel Townhouse in Potts Point and there were many stories told about who fell off which bar stool in the famous Sebel cocktail lounge. Now, with Yoplait, I would get the chance to fall off bar stools on the other side of the world. In Paris, we stayed at the Hotel Lutetia, an art deco monstrosity (since restored to something of its former glory) on the Boulevard Raspail on the West Bank, within strolling distance of St Germaine, the Seine, the Louvre…all the most romantic attractions of Paris. 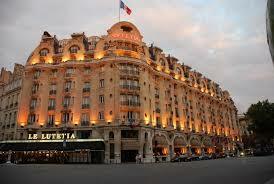 The Lutetia is now, apparently, a renowned meeting place for artists, writers and politicians, but in 1982 it appeared to be patronised largely by businessmen in ill-fitting suits. Our Yoplait shoot took place over three days and involved crew from London, Australia and Paris. The cast were French. Most of them were not required to be bilingual, as their sole piece of dialogue was the word “Yoplait”. 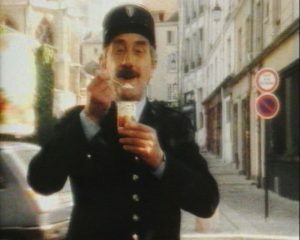 However, in one of the three launch commercials, our central character, cast as a gendarme, was required to address the camera in English. The actor we had chosen for this role had the moustache, the stomach, the mobile face and the personality for the part. However, he didn’t have the English. He needed to learn every line parrot-fashion, delivering the lines “It’s verrrry crrrrray-me, wiz verrrry big pieces of frrrruit” with such a guttural roll of the rs that everyone fell about laughing. It was perfect. Our gendarme, Jocelyn Canoen, went on to feature in future Yoplait campaigns, shot both in Paris and in the Barossa Valley in South Australia. His trip to Australia caused consternation among the women at Clemenger, especially a feisty red-head who had been designated as his keeper. By the end of his stay, Meredith had taken to hiding under her desk when she heard that Jocelyn was in the building. He seemed not to understand that a balding 50-something man was less than magnetic to attractive 20-something girls. After all, he was Frrrrrench! The Paris shoot had a few tense moments, especially on the final day when dark clouds began to gather. The budget had no allowance for another day’s shooting. The client was becoming agitated, stopping just short of asking us to get on the phone to God. The Chef Electricien just shrugged and wheeled out the HMIs (huge arc lights) and turned on artificial sunlight. Aaahhh…the magic of television. We held the wrap party at Les Deux Magots, where the ghosts of Simone de Beauvoir and Jean-Paul Sartre, Ernest Hemingway and Pablo Picasso hovered over us as we drank rather a lot of wine and scoffed our steak tartare and Entrecôte pommes sautées. The following night I took our client to the Brasserie 1925 Terminus Nord opposite the Gare du Nord railway station. All brass and mirrors and art nouveau, this classic Paris brasserie was once the property of the Northern Railway Company. We could imagine passengers on the Orient Express popping across the road to enjoy specialties like fresh foie gras and salmon en rillettes. The shoot was deemed a success, and in September 1982, Yoplait was launched. The combination of the advertising, the unique packaging, and the professional pitch to the supermarkets that resulted in a completely new layout of their dairy cabinet, made the new product an instant success. In fact, advertising had to be curtailed because the factory in Echuca couldn’t keep up. Australians began eating yoghurt in unprecedented quantities and by 1999 consumption per head had risen to more than six kilograms.